"Oh, you payed for these?" Ashe asked, surprised at what Fionn said as she looked back and forth from his plate to his face. "I thought they were part of the lottery. It said so in the pamphlet. All expenses paid." Thinking a bit, Ashe tries to come up with a solution, paying Fionn back for the pancakes he didn't need to pay for. Shrugging, she cuts a slice of pancake, coating it generously in syrup before skewering it on her fork and poking him in the lips with it. "Here. Aaaaaahn~"
Fionn rolled his eyes (so hard infact that if he had done so infront of some form of biologist they would have felt as if he was the next step in evolution for humans with super strong eye muscles) at the girl as she pushed the piece of sugar-soggy pancake against his lips (Getting the syrup on his cheeks and chin), before reeling his head back like a shark, looking around shadily, and jokingly doing what looked like somewhat of a pounce towards it. "I have succeeded in scaring my prey!" He said as a joke making fun of the piece of pancake as if it were sentient, before cutting off a slice of his waffle, dipping it in the bitter-sweet molasses, and doing as Ashe had done for him. Skylar looked over to the boy, but quickly brought her eyes back to the floor of the cabin, Dammit. She felt her hands shaking a little, but quickly clasped them behind her back. She took a slow but deep breath before she spoke, "Uhh...y-yeah." She said, her voice a little unsteady, Dammit, dammit, dammit. She chided herself, I knew this would happen, why would I put myself in this situation? She looked up as she heard a little bell ding as they reached their floor. She realized she had clammed up pretty badly, but at this point, she would give anything for the door of the elevator to open quicker. She looked over to the boy, quickly unable to do so and finding her eyes glued back to the floor. She heard the door slide open and her shaking quickly subsided, her hearbeat slowing as well, Thank goodness. She thought, able again to look at the boy and flash a smile, I hope that wasn't too obvious. "Looks like we're here!" She said, the nervousness out of her voice again. "Hey, don't play with food." Ashe pouted at Fionn not eating, giggling but giving her best 'You're doing something bad and you should feel bad' look as she pressed the pancake to Fionn's lips, feeling the waffle on her own. Tasting the molasses though, the sheep faunus quickly takes the bite, chewing and swallowing before she continued her attack, licking her lips clean. "I took my bite. Now yours. Aaaaaaaaahn~" She urged, smearing maple syrup all over his lips, the tines on the fork pierce through the pancake and poking gently at his lips now. "Aaaaaa-mmmph" Fionn said as the delicious piece of pancake was shoved into his mouth elegantly, he savored the sweet taste of the syrup in contrast to the slightly more savory pan-cake, he gulped the flatjack down and smiled, the syrup running down his face making him look as adorable as a trauma hardened merc can look, before taking another slice of his waffle off. "You do realize, this means war?" He said as he repeated the same actions as before, pressing the darkly stained molasses covered waffle to Ashes lips. Ashe giggled, politely pushing it away. "No no, back to eating the right way. I can't eat properly like this." She said, wiping off her mouth with a napkin, scowling as bits of tissue stuck to her face. Rubbing the tissue on the condensation from a glass of water on the table, she scrubs her face to get rid of the stickiness before returning to her meal, smiling at Fionn as she chewed. "I can't taste the pancakes if I keep shoving them in your mouth, besides. Momma says don't play with your food~" She joked, giggling lightly as she took another bite from her plate, finishing her first pancake. Mino was quite stunned. While Ashe and Fionn had been having a very "touching" moment she had been staring wide eyed at them. She shook her head to clear her thoughts and coughed a bit. She quickly tried to fill the awkward silence (at least for her) with some conversation. "Well uh the reason for the sugar love is because when I consume sugar I begin to become kind-off intoxicated. It's hard to explain but basically what happens is I become drunk but I don't have the least bit of alcohol in my system. I like to call this 'sugar-drunk' since that is basically what it is. Now the reason why I have to stay sugar-drunk is because that will perpetuate my existence. So if I consume sugar often enough then I can stay sugar-drunk forever. It's been working too, I've been sugar-drunk for over two weeks. The entire reason as to why I can afford the cruise is that I've been working the entire time I've been drunk. Hopefully I can keep this existence going. Then It's drunk Mino all the time." She finished speaking and began chugging her maple syrup. Fionn looked deeply into Ashes eyes at her comment, it hurt to think of his mother when not fully intoxicated and her words had really made him remember how awful it was living in that household. "Well my Mum always tol-" Halfway through his bad joke he was interrupted by Mino, when she was done her ramble he looked at the girl chugging the maple syrup and sighed smiling before reaching his hand over, taking the bottle of syrup out of the girls mouth, procuring his flask from his coat with a fancy looking throw and flip before catching it and drinking a sip, and finally handing the whiskey flask to Mino. "So you keep yourself from depression by remaining constantly sugar high eh? Then why not taste a bit of my brand." He said cockily to the girl, but with a right too seeing as when removing depression with narcotics is the subject Fionn is the teacher. Faunus auds would be given a flicker as their host continued to gaze over at Skylar, registering the way she was behaving and slightly moving within his intellect. ...All of the sudden, I feel like I did something wrong, he thought to himself, his expression leaning away from its normal, emotionless stature and toward a faintly concerned look as he felt a small tinge of guilt take a hold of him. Thoughts of asking whether or not something was up shifted within his mind, though he pushed the questions he had away...for the moment. Slowly he would avert frosty voids back toward the door, just as a high 'ding' entered both bestial and humanoid ears of his. As if hesitating some bit, he took the first few steps forward after the doors opened at a gradual pace, ceasing himself right outside and gesturing toward the hallway. He shifted the same hand that he had brushed up the back of his skull earlier, pointing down the sector with it. "Well...the restaurants await your arrival. Shall we be off?" Ashe noticed Mino staring after her second bite, cocking her head curiously at the girl. As the girl spoke, the gears slowly began to turn in Ashe's head, waiting for her to finish talking before she finally spoke herself. "Well if being... sugar-drunk is good for you," She said, slicing another piece of pancake and smearing it generously in syrup before pressing it to her lips, "Here, you can have some of this and before you say anything Fionn, I'm not playing. I'm helping." She added, turning to flash the boy a grin before turning back to Mino, waiting for her to take the bite. "Aaaaaaahn~"
Mino opened her mouth and allowed Ashe to feed her the syrupy piece of pancake. She then quickly shook her head at Fionn. "No thank you, being sugar-drunk and being really drunk are two different things. As a matter of fact real-drunk Mino is really dangerous she want's to get sober Mino and kill her so that it's drunk Mino all the time. At least I have some common sense and dignity. So thanks for the offer but it would be better to not." She then finished her drink and her pancakes. Mino offered Fionn a small amount of Lien. "This is to help you pay back the chef for the pancakes I ate. It should pay for at least half of it maybe more." Matt hears Natasha's stomach growl. Yeah, she definitely sounds hungry. But then, she grabs and hold his arm close to her chest. His mind shuts down for a second as he processes this latest advance of hers. He snaps back to reality and he looks at her, a small smile on his face. "Sure. I could go for some food. Do you know where the restaurants are?" Natasha enjoyed the pause from Matt as he stared down at the obvious. "Good, I know just the place." she purred as she dragged him along towards the elevator, arm still between her chest. 'I'm sure Natalie would just love what I'm doing.' she thought with a wide grin as she pressed a button, finally letting his arm out form her chest, but still gripping his hand. "It's Natalie, by the way." She said with a perky smile. She knew that if her real name, Natasha Fay, would raise the alarm on the somewhat renowned killer was around that things would be a little to tense for her to have fun. The elevator arrived quickly as she hopped on, pressing the button for the floor that the cafeteria was on. "Can't wait to see what they have!" In reality, Natasha hadn't been the one to eat anything for quite some time, and she was itching to experience some top of the line cuisine for once. During her excitement, she finally let go of Matt's hand as she reached her arms up to stretch. Figuring that she didn't need to led Matt around, especially after her display of assets, she left out the door as soon as it opened, following the smell of breakfast with her strong sense of smell. After rounding a few corners, she found herself standing in front a smorgasbord. She started to lick her lips as she reached for a plate. Before long she was enjoying the scent of fresh waffles and hot syrup on her plate. Looking up from the delicious food, she began scanning for a spot to enjoy her meal. Skylar stepped out of the elevator, hearing it slide closed behind her. She looked down the hall, then back to Haven and flashed the boy a smile. Breathe. She had to remind herself, It's alright now. She gestured vaguely down the hall, "Of course!" She said cheerily, all hints of nervousness leaving her voice, "Lead the way." She said with her usual confident smile back on her face. Feeling the smallest grin of his own to spread across his lips, the lad gave another nod, ashen locks of his swaying faintly at the action. The eastern extremity would hook upward, adjusting the position in which his weapon was secured upon his shoulder into a more comfortable stature. Once this was done it would join the state that the other hand was in, slipping within the second pocket within his jeans and becoming concealed for the most part. "Hey, so..." would be the first thing that the chap managed vocally after a few seconds, after he began striding through those around him and toward the central area of the current floor. After a moment he would cut himself off, showing the trace of hesitance he was seeming to hold toward the thing he was about to ask. Sighing silently, however, he shook his head, looking over his shoulder and at Skylar while continuing onward. "Couldn't help but notice your little change in behavior. I know you just met me and all, so you have a right to keep your thoughts to yourself, but...is something up?" he asked, the left bestial aud of his giving a quick flicker all the while. "I'm just curious, is all. And again; you don't have to say anything if you don't want to." Skylar walked along next to Haven, following him towards the center of the ship. As she heard the question, her smile faltered just a little, caught off guard by his straightforwardness. She looked down to the floor, watching her feet pass one after the other and said, "Oh that...." She paused for a moment, pushing her hair back behind her ear again before saying, "That's nothing, I just get a little claustraphobic is all." She did her best to sound convincing, but she never had been a good lyer. Even so, she figured that the answer would at least satisfy him for the moment. She picked her head back up and looked over to him, "So where's this place we're going to, anyway?" She asked, still not used to the relatively unusual layout of the large cruise ship. Ashe listened as Mino told her story, absentmindedly cutting up her pancakes and eating, chewing them thoroughly and savoring the taste before swallowing and repeating the process. "Well if being sugar-drunk is better than being actual drunk then I better help you then." Ashe said, coating another slice generously in syrup, skewering it and once again pressing it to Mino's lips. "You're sharing all of this with me. Aaaaaaahn~"
Fionn did a dismissive wave with his hand at the offer of the payback for the food. "Nah i already said it's fine, i have more money than i know what to do with." He said happily to the girl before picking up his flask from where he had stood it (In front of the girl) and taking another sip before capping it off and placing it in the dark recesses of his coat, the sweet smell of his favored whiskey emanating off of him slightly to the sensitive nostrils of nearby Faunus like a perfume. He looked over to see Ashe attempting to feed Mino once more and chuckled slightly at the adorable sight before him. Guilt would briefly overcome the swordsman as he saw Skylar's grin shrink down a tad, and it became visible upon his expression as his own little excuse for a smile seemed to fade away completely. Aaaah dammit...I swear, my curiosity's gonna send someone over this ship somehow... he thought silently, attempting to fight away the urge to rake his hands through his hair and across his head in some, sudden stress. Marlin soon walked into the dinning hall where he looked around at the meals. He looked at the food the seemed to be having and heard his stomach growl. I do suppose a meal is in order. He quickly grabbed some pancakes, bacon, and sausage links. He then buried his pancakes in syrup. He looked around and found a empty table to eat at. He then sits down and begins to eat. Skylar noticed a change in the air, the smell of breakfast wafting to her nostrils, Oh, that smells good. She thought. The sound of a number of passangers already enjoying their meals began to be heard from not too far down the hall. "Oh," She said in response to Haven's answer, "That sounds pretty good, and it might be a little too early for a drink." She giggled a little, seeing as she almost never thought that was the case. They walked for another moment in silence before Skylar spoke up again, "So what's your story? Why did you come to Beacon?" "Eh...my reasons aren't really out of the ordinary." His hand would drop, unstrapping the hat that he had been wearing earlier from the chains he had secured it upon while he was still in the elevator. "I got into schooling because my parents enrolled me, and I guess I liked it, in contrast to many people who attend various academies and schools. When it came time that I exited Sanctum, I signed up for Beacon on my own free will and got in. Again, not that big of a deal," he said, shrugging. 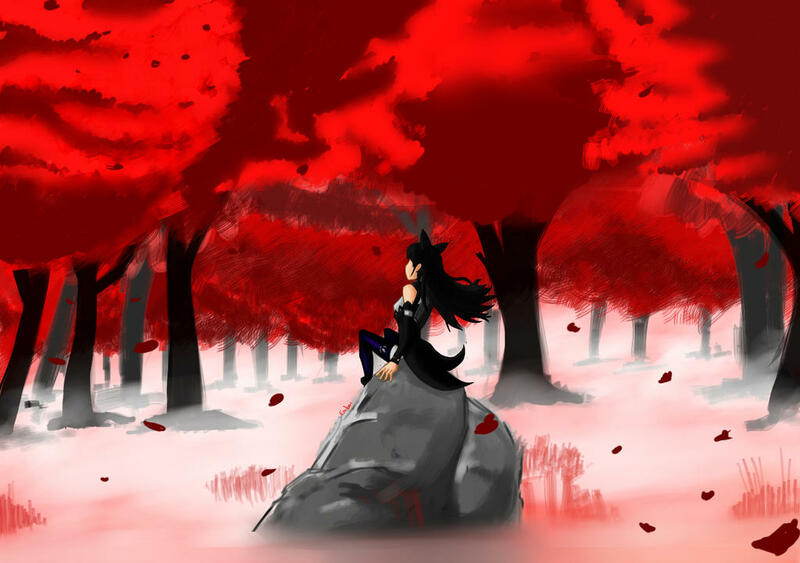 Faunus auds would pin faintly against his head and he breathed a quick, silent sigh while a series of memories entered his intellect from a couple years back. "Of course, I had my reasons other than interest. For example...wanting learn more and to get stronger in order to protect the loved ones, and all." At the end of his statement the sword wielder would fall silent, shaking his head before carefully laying his hat upon his head yet again. "So, what about you?" Skylar thought for a moment, Huh, I guess I never really considered that question. She thought about it for a second before answering, "That's a good question." Her brow furrowed, "I guess I enrolled to Signal to get away from my family," She said, "I kind of ran away from home when I was little, and after I finished at Signal...I just never really gave a second thought to enrolling at Beacon." She answered, a smile returning to her face, "I don't have a good reason, I guess, but I don't have any regrets." Grinning slightly as the training Huntress went on, Haven directed his gaze toward the side, looking toward her through narrowed voids. "So you've been quite the free spirit, haven't you?" the lad questioned, his tone raising to show the slight amusement and interest he held. "I assume that your reasons for leaving your family weren't exactly among the most positive, but the larger amount of freedom you got from it was pretty good, eh? Not being bound down by the normal restrictions and such...stuff like that." He allowed his eyes to trail off after saying this, locking them upon the enlarged room he was then seeing before him. Various scents wafted his way, accompanied by the constant bustling of customers enjoying their meals from within. ...On second thought, he began thinking to himself, I think that training could wait maybe an hour or so. "Well, here we are. Now that we're here, I actually think I'm gonna hold going to the arenas off until later. Everything here just smells too good to pass up," the chap claimed, glancing back toward Skylar for a moment. Similar to how he had done so at the elevators, he lifted a hand toward the many delicacies awaiting as if silently saying "After you." Mino ate the syrupy piece of pancake that was skewered on Ashe's fork. "Man, no wonder you guys did that before it makes the pancake taste one hundred time better!" She then looked around the cafeteria that until now had been empty except for them. "It sure is getting crowded in here, at least compared to before when it had only been us. A few of these people appear to be students of beacon." She then took a piece of pancake dipped it in maple syrup and held it to Ashe's lips. "Where are my manners! You feed me so it's only fair that I feed you. Now say ahhhhhhhhhhhhh."